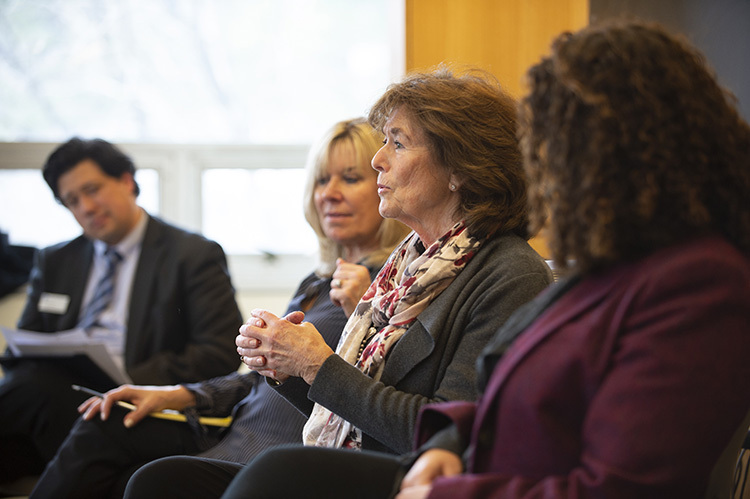 (left to right) Andy Coville '82, Natalie Jacobson '65 and Katie Bouton '96 visit a communication class to talk about how their liberal arts education prepared them for their careers. With a liberal arts degree, you might become the CEO of your own consulting firm, lead a national public relations company or work as an award-winning television anchor. 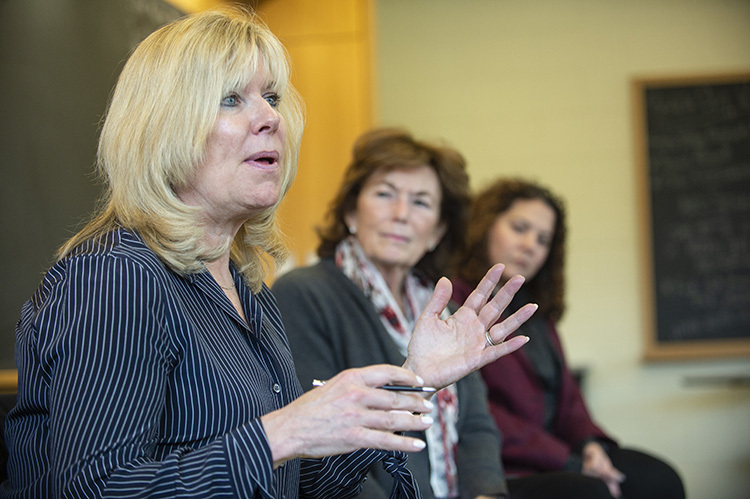 A UNH alumni panel visiting Assistant Professor Kate Zambon’s Introduction to Media Studies class last month represented each of these leadership positions and encouraged students to be curious and take risks throughout their academic journeys. Katie Bouton ’96, CEO of Koya Leadership Partners; Andy Coville ’82, CEO of Brodeur Partners; and Natalie Jacobson ’65, former anchor of WCVB-TV Boston; all members of the COLA Development Board, addressed students in an alumni panel sponsored by COLA and Career and Professional Success (CaPS). Alumni talked to students about how their liberal arts backgrounds prepared them for their first jobs and continue to support their careers. They urged students to ask questions, take advantage of new experiences and opportunities offered on campus and to think of themselves as problem solvers. Natalie Jacobson '65 encourages students to overcome obstacles in pursuit of their dreams. Jacobson, who was an English major, encouraged students to overcome obstacles in pursuit of their dreams. She illustrated for students the challenges women in the mid-1960s faced in securing a professional job. The first newswoman that WCVB-TV had ever hired, Jacobson spent 35 years at the Boston station breaking news stories, after spending several years trying to break into the business. She told students to use their critical thinking skills and question what they hear and see on the news. Bouton, who also majored in English, wrote for college publications and was a member of the UNH Swim Team. She said her undergraduate experience helped her meet new people and discover her passions. Today as CEO of Koya Leadership Partners, she helps national nonprofit organizations such as Greenpeace and Amnesty International fill key leadership positions; but initially, she started her business in her home. Coville, another English major, described the late Professor Don Murray and former Professor Andy Merton as her mentors. She worked in newspapers before landing an in-house job at a software company, which took her to California, where she met Bill Gates and Steve Jobs. Moving back to Boston, she founded Brodeur Partners, a public relations firm that now has clients in the technology, space, health care and financial services sectors, to name a few. Raul Bernal, COLA CaPS director, says that COLA has hosted alumni panels in the past, but this was the first college-wide collaboration to present distinguished alumni panels to multiple classes simultaneously in communication, political science, philosophy and geography. Panelists in other classes represented a wide variety of professions including upper level executives at financial services companies BlackRock, JP Morgan, BNY Mellon, Envestnet and UBS, a strategy director at F5 Networks and an English professor at Colorado State University. Bernal adds that the purpose of these panels is to demonstrate the range of career paths students can take by pursuing a liberal arts degree and to introduce students to the power of the UNH network. “This also allows us to engage with our alumni and provide them an opportunity to give back to current UNH students in a mentoring capacity,” he says. Zambon says the panel provided a strong connection to some of the themes students study in the Introduction to Media Studies class, including investigating how media technologies, regulation and industries relate to the public interest and to the kinds of media available to the public. She also says the panel helped students further recognize the value of their liberal arts education. William Mauer, a first-year student, who hopes to pursue a career in marketing, asked the panel whether employers took student debt into consideration when they interviewed candidates. He says he was relieved to hear they did not. “I learned the vast majority of companies are looking for the critical thinking skills that a liberal arts major provides,” he says. Trudy Van Zee, UNH’s Associate Vice Provost of Career and Professional Success, is pleased with the collaboration that made this event possible. “We believe in partnerships — they power the mission of Career and Professional Success. It doesn’t get much better than the CaPS, advancement and alumni trifecta,” she says. Students in a communication class engage with alumni panelists about careers.